It’s Bertolt Benny time at Three Clubs on a hard-hittin’ noirish train ride into poetic surrealism. Twice. 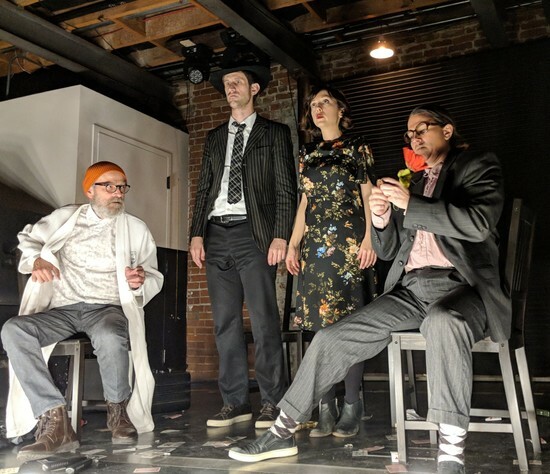 Padua Playwrights‘ Jack Benny (A Menage En Train) was preceded on preview night by a brief explanation by creators Juli Crockett, Gray Palmer, & Guy Zimmerman – this is a piece that started as a three-person writing exercise, re-assembled as one piece, then directed as a stage film noir, recorded as a podcast, then performed again. While this information is in no way vital to enjoying the show, it certainly impacts the way you may think about the action on the stage. But you should probably stop thinking and just let it wash over you. The performances are top-notch from characterization to style to movement to diction (something woefully undervalued in so much theater), and the choice of Three Clubs as a venue adds to the 40’s vibe. Notable is the light and sound tech which is incredibly specific and adds a great deal to the feeling of the piece. If you’re into rapid-fire epic surrealistic theatre, this will be your jam.